We’re crazy about this gorgeous botanical garden in Medellin, Colombia that was renovated in 2008 by Plan B Architects. The Orquideorama is an organically expanding wooden meshwork of modular “flower-tree” structures that weaves its way through the garden’s heart. A stunning study on structure and scale, the project unites the micro and macro worlds through an elegant synthesis of cellular and architectural forms. Architects Felipe Mesa and Alexander Bernal wanted the Orquideorama to grow in the same way that a garden seeds and develops, with one “flor-árbol” popping up next to another. This lead them to design the installation as a series of interconnected modular structures (14 in all) specialized for a variety of functions including event halls, butterfly reserves, and flower gardens. Fittingly, this repetitious cellular weave resonates with another organic structure: honeycomb. 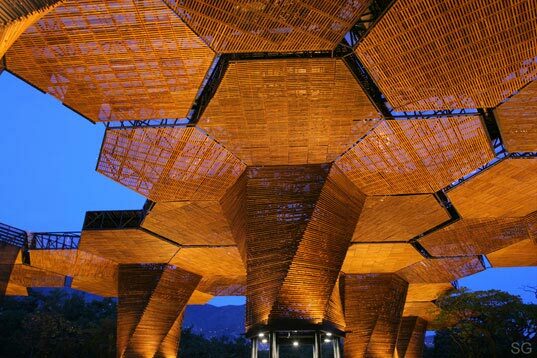 Each “flor-árbol” is composed of a steel reinforced trunk and six hexagonal petals that form an intricately latticed patio. 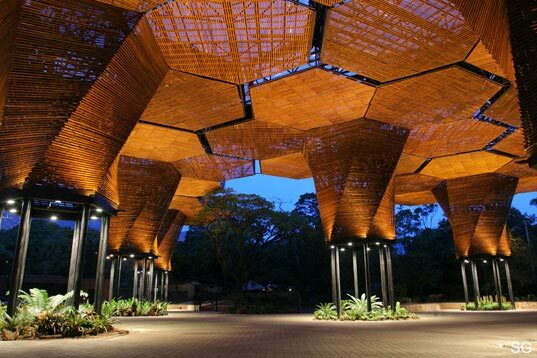 The plants situated beneath each trunk are sustained via rainwater collected by the petals, and are protected from the elements by the translucent pine wood weave that is sourced from reforested lands. Taken as a whole, the Orquideorama is a delicate display of the relationship and structural similarities between architecture and living organisms. do you have attachment details? like how it is constructed? A friend of mine designed a ferro-cement building system similar to this back in the 70's. The flower petal shaped components mounted on a 3" pipe and used triangles for glazing, cut from 4'X250' rolls. You could cover 1/4 acre with greenhouse or 4,000 acres. Each 6 sided component would lock onto others like a honeycomb? Hard to describe but a brilliant way to create a bio-zone for arid and/or cold areas. The SUSTAINABLE adjective can be used to illustrate the protection of forest vegetation in the urban milieu. This structure makes it possible for city dwellers to get near to species that if not protected could easily be extintc in theis natural forest environment. This new colombian design contriubution can raise awareness to the importance of protecting natural resources to save our planet. Then, the building is important for our own sustainability! Hi Simone- Point taken! Thanks for the sharp eye. umm, so how is this "sustainable"? The correct name of the country in which this amazing structure was built is Colombia and not Columbia. Aha, this looks great. But it can't be very protective against rain and other influences (creating a great inside out effect). But anyway, this is made to look very beautiful, and it does. Incredible detail! We're crazy about this gorgeous botanical garden in Medellin, Colombia that was renovated in 2008 by Plan B Architects. The Orquideorama is an organically expanding wooden meshwork of modular "flower-tree" structures that weaves its way through the garden's heart. A stunning study on structure and scale, the project unites the micro and macro worlds through an elegant synthesis of cellular and architectural forms.